I have made this recipe SO many times, I knew that I was long overdue in sharing it with you. It is so incredibly delicious, the perfect marriage of dark chocolate and tart berries, all in a healthy Paleo, GAPS friendly food! Do not be intimidated by the cook time here. While there is no instant gratification with this recipe, the actual time required of you is very minimal. Trust me, you must make this. In my personal opinion, the freeze dried berries are not at all optional. I get mine at Trader Joes, and use either raspberries or strawberries. 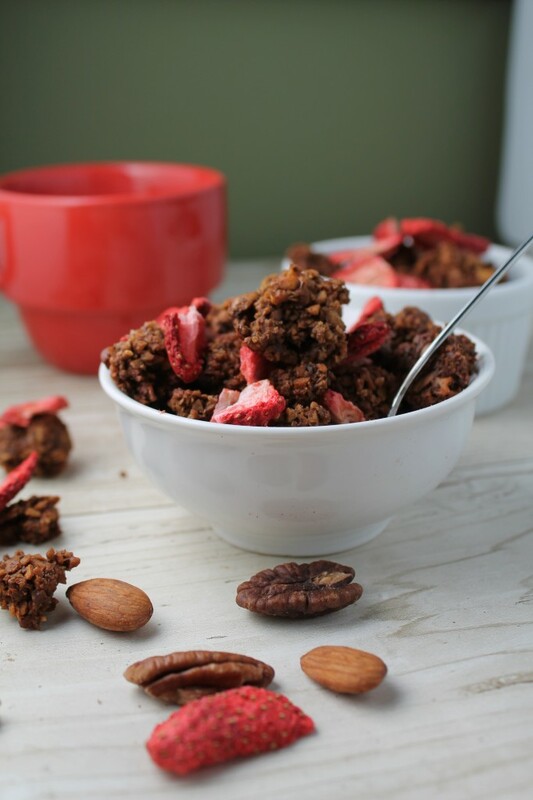 This recipe comes to you from Danielle at Against All Grain. Danielle has one of my very favorite blogs, I have made countless recipes from her site, and her pictures are always drool worthy. I have used a variety of nut mixes, all good, use what you have on hand! I have also replaced the egg with chia egg with success for a vegan goodie! I do not own a dehydrator. I used my oven at 170 degrees, and it took all day to dehydrate. I have since increased the temp to 250 degrees and it takes around 4 hours, give or take. Enjoy people. this is CRACK in a healthy suit! PS: I wish all things were as easy to photograph as chocolate and berries!! Thanks for sharing your tips on making this recipe, Tessa. 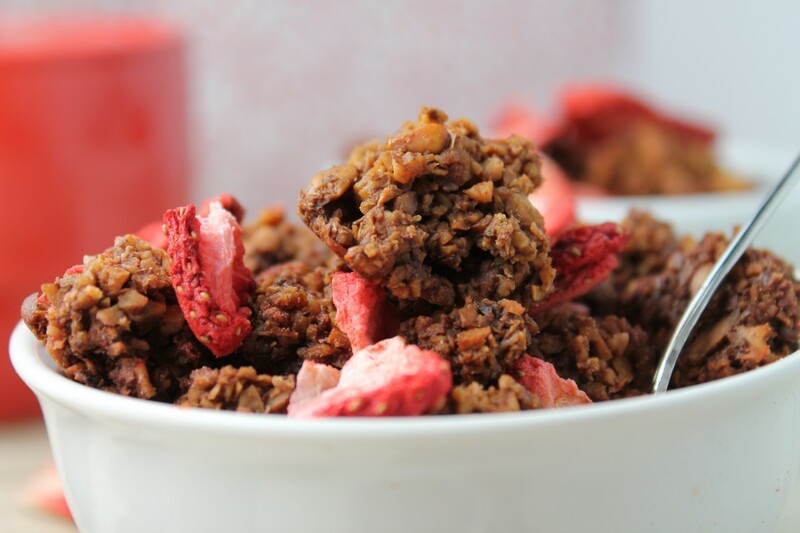 My husband eats granola every day, I really ought to give this recipe a go 🙂 Thanks for sharing this on Waste Not Want Not Wednesday, I’ve pinned it. Now this is my kind of breakfast! 😉 Thanks so much for sharing it at Savoring Saturdays, Tessa! Looks like you get two features at Tasty Tuesdays this week! I am also featuring at Red Cottage Chronicles! 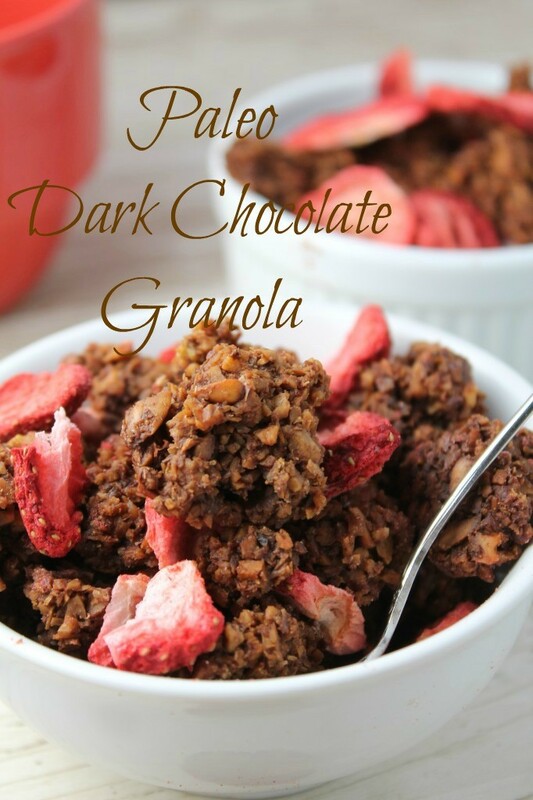 Chocolate Granola….yum! I am featuring your recipe in this week’s Tasty Tuesdays! Woo! I hope you stop by and linkup again this week. Crack in a healthy suit! It sure sounds like it! Hi Tessa! I’m featuring this tomorrow at Raw Foods Thursdays. Must spread the healthy crack love! Great recipe – one I will have to save. Healthy and tasty and who doesn’t like chocolate YUM! Visiting from Wildcrafting Wednesday Blog Hop! Have a healthy wonderful day! Oh, my goodness! That looks heavenly. It’s like dessert for breakfast. If you haven’t already, I’d love for you to visit my Gluten-Free Monday party at OneCreativeMommy.com and link up this and any other GF idea you would like to share. I hope to see you there. Tessa, all I have to say is Yum and your pictures are gorgeous! YUMMY! got this tweeted and pinned! I also voted for you today! Mmmm this really is becoming one of my favorite recipe sites. I need to stop reading these at night when I want a snack! Thanks for sharing on Natural Living Monday! I would just love this Granola, it looks like a real treat. Hope you are having a great weekend and thank you so much for sharing with Full Plate Thursday. Hi Kammie, thanks for the comment! I will check your apple donuts out! Chocolate for breakfast. Yeah that sound alright to me. Looks AMAZING! I agree, don’t think the freeze dried berries should be optional either! Thanks Carol…great minds think alike!! Crack Granola-I want this over homemade yogurt 🙂 MMM-YUM! healthy crack?! sign me up! haha sounds delish! This looks so good! I have to make this immediately!!! now you’re making me desperate to make a batch!! You won’t be disappointed Kristy, enjoy!